Cool, Modern and Unique Dining Table Sets for a Cool Living Room! Since I am on a quest to find the perfect dining table set for my home, I decided to create this webpage today so I can also help you find one for your home! If you know my work already, you also know that I LOVE unique, modern and cool furniture, so naturally, I am looking for a cool and very unique modern dining-room table set for sale! 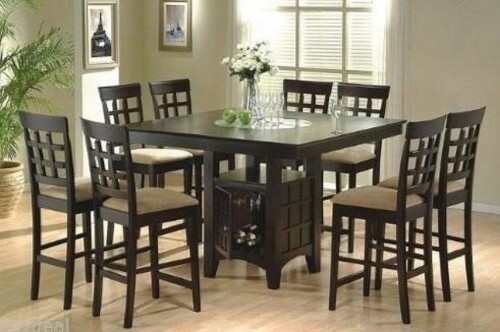 I have a medium size dining-room, so it will fit either a 7-piece or 5-piece dining table set. I like the 7-piece ones a little better just because my husband is a cook and we love to entertain. Obviously the 5-piece ones are cheaper and smaller, so I guess it all depends on your budget and dining-room size. *Even though I have a medium-sized dining-room that probably wouldn’t fit a large 9-piece tall dining table set, I am going to start with those first, just because I think they are absolutely gorgeous and so fancy looking! 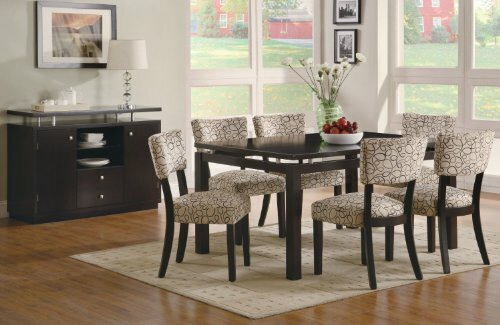 If you have a large dining-room and are looking for a very elegant and modern 9-piece dining table set, I think you are going to love this one! It is a tall dining table set in a gorgeous cappuccino finish that also has a very cool and unique storage base, where you can place your wine bottles! Just reach underneath the table and grab your wine! 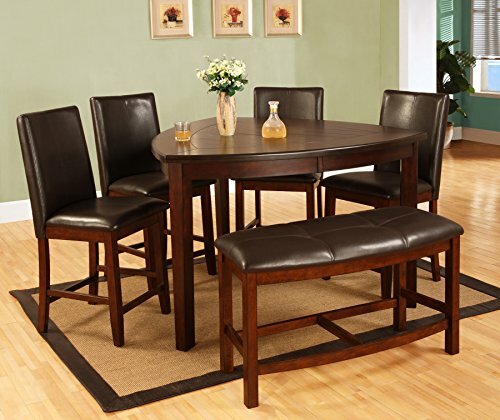 It is a heavy and very sturdy dining-room table set and the chairs are also nice and comfortable! 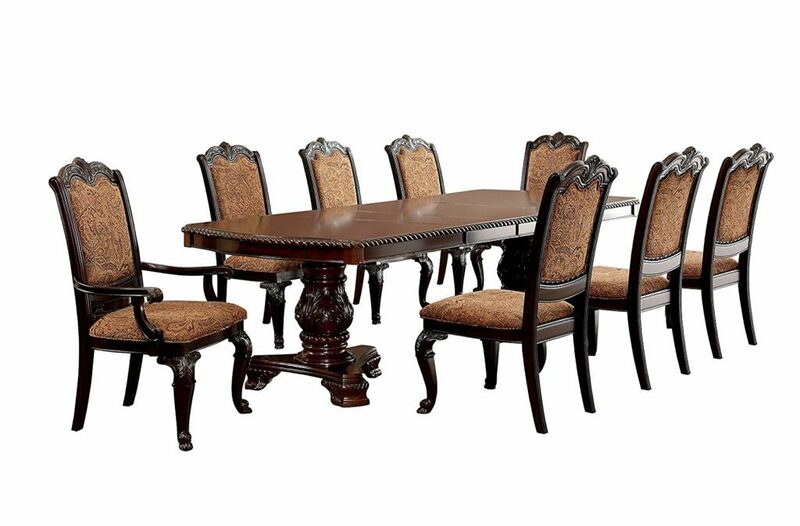 Another gorgeous and very fancy looking ‘antique style’ 9-piece big dining-room table set for sale in a beautiful brown cherry finish color! It is a very warm and inviting color to have in a dining-room. The chairs have a beautiful stylized patterning fabric and are very nice on your back. This gorgeous 9-piece wooden dining-room table set would probably work in my dining-room just because the tabletop is expansive! When you have guests over just ‘expand’ the table! I love the cute and unique chair design and the dark hazelnut finish! 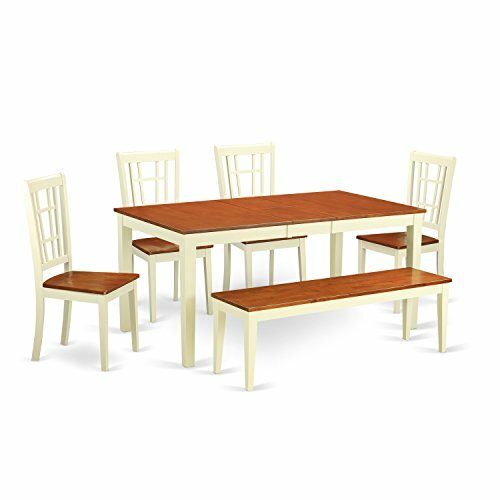 Changing completely the game here, from fancy and elegant, big and tall 9-piece dining table sets to cute, fun and casual dining-room table sets, how absolutely adorable is this white ‘buttermilk’ color and cherry 6-piece wooden dining-room set for sale? It includes four cute chairs and a cute bench! Look how it brightens up the room! The price is totally fair! I love this ‘farmhouse’ style! If you also love unique dining-room table sets, I think you are going to love this dark cherry triangle shaped table set! Isn’t it beautiful? The chairs have a gorgeous chocolate brown color faux leather upholstery, just like the cute tufted bench. As you can see, 5 people can sit comfortably around the cute triangle table. 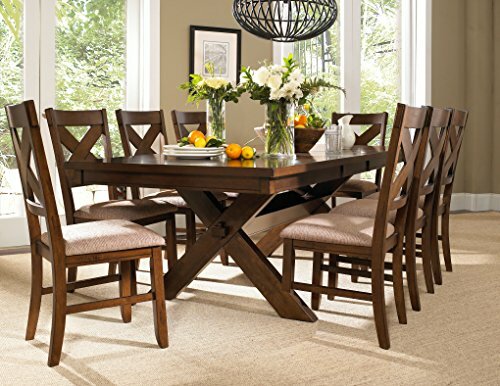 Perfect dining table set for a small space. 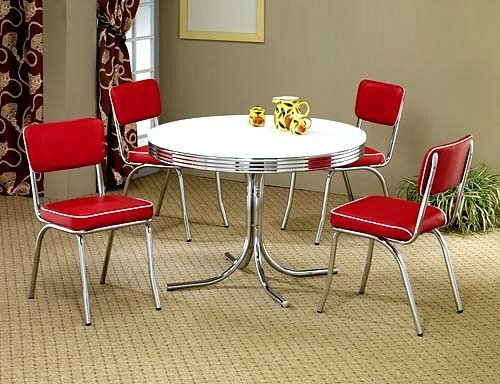 Adorable Retro Style Dining Table and Chair Set! I also LOVE retro-style furniture! If you are looking for a beautiful and unique Asian style dining-room table set for your home, I think you are going to be very impressed with this one! 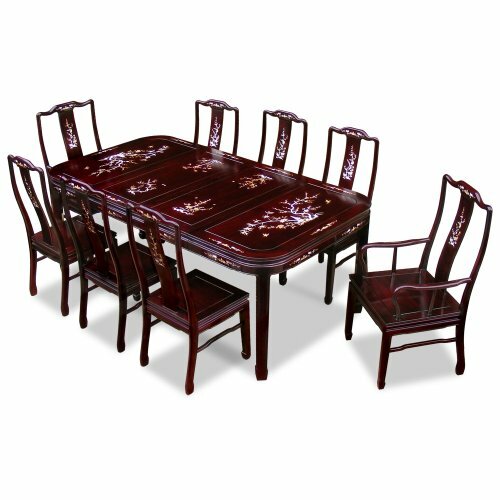 It is a FANCY (and expensive) 9-piece Chinese dining table set made from the best solid rosewood! It has a gorgeous Mother-of-Pearl motif on each chair and table! The gorgeous table is also very shiny! Cute Dining Booth Sets for Home!